The Singingbelt- A revolutionary device in vocal training invented by star vocal coach Ruth Gerson. 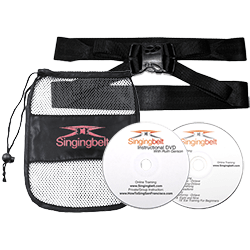 The Singingbelt was created in the classroom to teach singers how to use the diaphragm, support the voice and master breathing for singing. A 55min. Instructional DVD- Shows singers how the diaphragm works, how to use the Singingbelt to improve breathing for singing, with vocal warm-ups for breathing, positioning of the tongue, mouth, jaw, palate and larynx, breath placement and ear training. A 45min. Vocal Warm-ups CD- Provides singers with a faster approach to their daily vocal exercises once they understand the concepts behind the Singingbelt System. A Carrying Pouch: For easy and simple storage. The Singingbelt System comes with a satisfaction money-back guarantee. Practice 30min./day for 30 days and if you don’t hear an improvement in your voice, return it for a full refund. Instructional DVD - 55 mins. Vocal Warm-Up CD - 45 mins. Full Satisfaction Guarantee - Practice 30 mins./day for four weeks and if you don't hear a difference in your voice, return the Singingbelt System within 60 days for a full refund.